Circulate San Diego and other housing advocates called on the San Diego Metropolitan Transit System Thursday to develop underused parking lots into affordable housing. “They’re really prime locations to create new opportunities for people to live,” said Colin Parent, executive director of the nonprofit group, which advocates for sustainable growth and transportation projects. “It’s challenging to sometimes find appropriate land to build these new homes that the region desperately needs,” he said. Circulate released a report last month estimating MTS has more than 57 acres of property that can be converted into more than 8,000 apartment or condominium units near trolley and bus stops. The report analyzed parking lots near 14 stations and found that six are at least half empty on average. The lots are mostly located in eastern San Diego, Chula Vista, El Cajon and Lemon Grove. Building complexes near shared transit stations could complement municipal climate action plans by reducing reliance on vehicles. 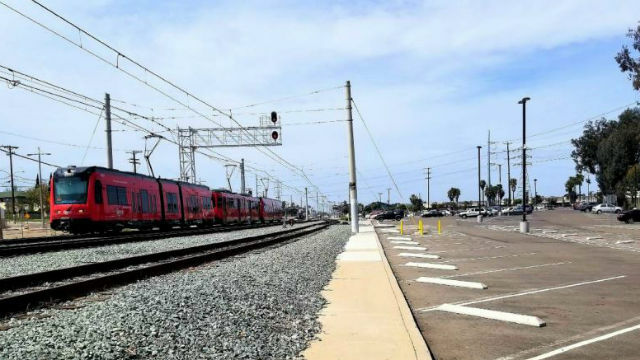 San Diego’s plan, which calls for slashing greenhouse gases to 50 percent of 2010 levels by 2035, prioritizes development of areas within a half-mile of major transit stops. Apart from contributing to climate goals, developing near stations can benefit low-income residents, Parent said. “They’re right next to transit, which means people who live there will be able to get around more affordably without owning a car, or owning fewer cars in the case of families,” he said. Of the 8,000 hypothetical lot units, Circulate’s report recommends about 3,000 be reserved for affordable housing. That figure is based off housing development projects conducted by the Los Angeles County Metropolitan Transit Authority, Bay Area Rapid Transit and Santa Clara Valley Transportation Authority. Each project requires a similar percent of units be reserved for low-income renters. MTS has developed several of its properties into housing complexes in recent years after receiving unsolicited proposals, according to Circulate. Parent said MTS should actively seek development proposals, however, to encourage more successful projects.